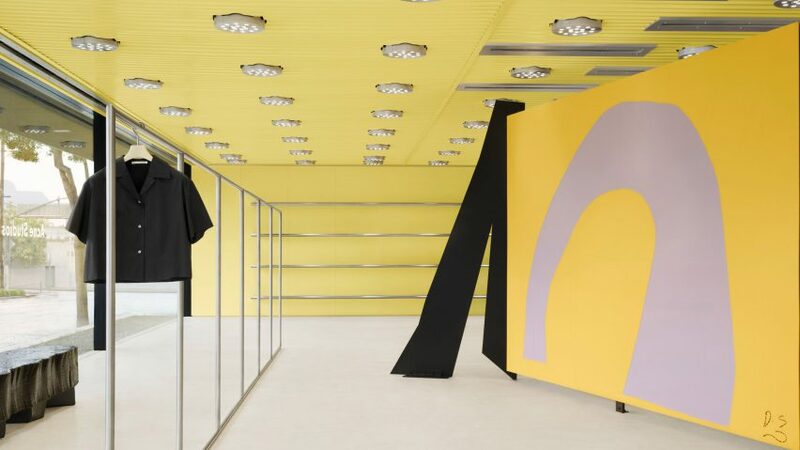 Acne Studios' recently opened "pale acid yellow" store in West Hollywood features a sculpture by artist Daniel Silver that doubles as a fitting room. The store on Melrose Avenue – the fashion brand's second in Los Angeles – is housed in a pavilion-like single-storey building in the trendy neighbourhood, where many high-end fashion brands have outposts. Designed with London firm Geoff Crowther Architects, the space is dominated by a shade of yellow that Acne Studios calls pale acid, which covers the walls and corrugated ceiling. Floor-to-ceiling glazing across the front facade means the colour is highly visible from the street, particularly at night. In the middle of the room is a specially commissioned artwork by British sculptor Silver, comprising a series of cashmere panels patterned with blocky coloured graphics that complement the yellow. The fabric is supported by a blackened aluminium frame and the structure can be entered by shoppers wishing to try on apparel. The idea for the sculpture stems from simple constructions, such as improvised shelters, but Silver has moved further, combining his own sculptural aesthetic applied to cut fabric, with a more mechanical style. "I love that in LA we have the space and light to make Daniel Silver's work the focus of our new Acne Studios store," said the brand's creative director Jonny Johansson. "His structure feels alive, and sets the mood for the whole location." Styled for the opening, the rest of the 250-square-metre space displays just a handful of clothes and accessories. Four stainless steel shelves that stretch 10 metres along a wall are populated with just three sweaters and a bag, while a single jacket hangs from rail in front of the windows. The store also includes pieces by long-time Acne collaborators Max Lamb. The London designer, who designed the brand's Madison Avenue outpost in New York, created a set of custom black seating. Eighty-five round aluminium lamps by Paris lighting designer are fitted into the wavy ceiling. Along with the street entrance, visitors can also access the shop from the back, where a concrete courtyard patio is framed by a yellow wire fence. The concrete is continues in the store as flooring throughout, to "play on the notion of indoors and outdoors and invite into a continuous open space". Acne Studios was founded in Sweden in 1996, and each of its stores around the world has a different character. In Seoul, a translucent lightbox hides the concrete interior, while the ceiling is painted pink in Milan.